CSR, remember? 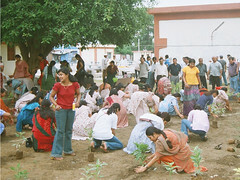 Heres one of the snaps, where all the women were made to go to a certain designated plot of land, and asked to start planting the saplings, together. This plot would be nice n pretty once all saplings become trees, and also provides a perfect opportunity for the photographers to finish a few reels/ fill up a memory card! Wheres me? The one on the top right corner in a blue t-shirt. The girl in red is have the free Mazaa (of all things!) we were provided! Note the men, helplessly trying to egg us on ;) unable to be a part of the 'planters' because of the photo shoot and it being a 'womens initiative' and stuff! I refuse to post the snaps with clearer view of ppl! Thats what I had mentioned in my post, if u remember? and told u on phone also! there are many other snaps where im in the forefront 'hogging' the snap. no, i dont know that woman in red. but I chose this for reasons particular...as i hinted in the commentary beside the pic, if u would take time to read it that is.